Did you know that a Mercedes Benz S Class has about 100 million lines of code in the car’s onboard control system? Neither did most of us, which is why Riviera partner and tech guru Sam Wholley was recently invited up to Seattle to give a talk at Talent42, a conference dedicated entirely to tech recruiting. Sam is no stranger to playing the role of instructor–he regularly runs courses in engineering basics here at the office. 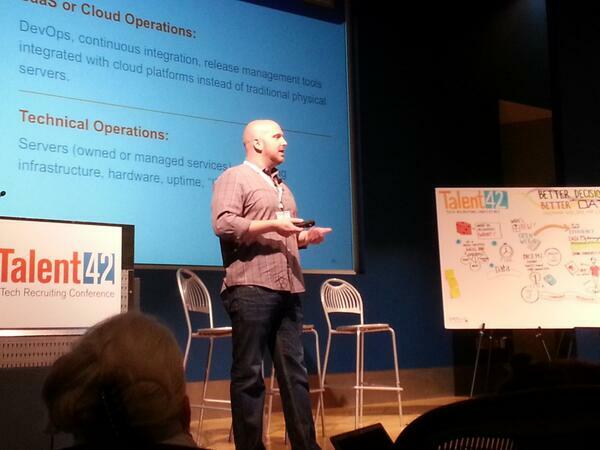 At Talent42, he gave attendees a crash course in some of the most commonly-asked questions that help companies think about engineering roles in a different way. Sam’s regular courses are more than 10-12 hours long, so this was a very summary version. Given the huge demand for engineers, this type of training is incredibly valuable in helping recruiters understand the technical nature of these positions. And this is important because, often with engineering, hiring managers are too narrowly focused on a specific skillset when, in many cases, the requirements for some roles are overly constricting. For instance, an experienced, intelligent engineer whom is expert in Ruby or Java can learn Python within a week or two and deliver significant ROI over the course of her tenure at a company. While this may not be ideal for a four-person company, larger companies can often benefit from training the right individual. A holistic thinker with a solid understanding of object-oriented design will take quickly to any language. The key is to come right out and ask a hiring manager to give reasons why he or she has a specific set of requirements. Sometimes, they have a good reason for seeking a specialist, but more often than not, they’re unnecessarily narrowing the funnel and a generalist could be a good fit. Of course, even with some general knowledge in code and the like, it can be tough for some recruiters to discern what “good” means in engineering. For those who aren’t hugely technical, Sam suggests they have the candidate explain his or her accomplishments in layman’s terms. If they can’t explain it clearly and concisely to someone who’s not technical, they probably don’t truly understand it themselves. They should be able to opine on predictive analytics, as opposed to just offering a textbook response. The best engineers build for extensibility and ease of maintenance. Object-oriented programming follows how the human brain works (“is a” and “has a”). The “cloud” is where stuff is stored when servers are not on the premises. The hottest languages are Ruby on Rails, mobile (iOS and Android), Python, and Java (in that order). The hottest disciplines are Big Data, data science, DevOps and cloud architecture (in that order). Want to check out the full crash course? You can view Sam’s presentation here.